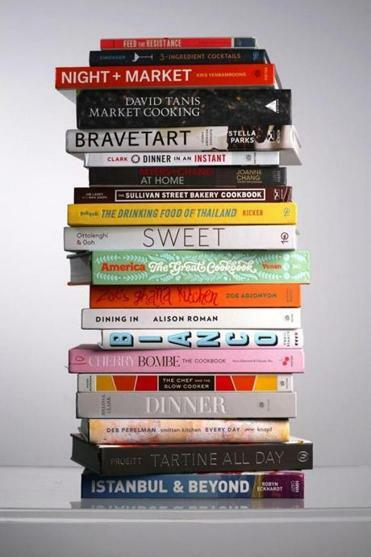 A roundup of cookbooks for holiday giving. Maybe you already know what to get your spouse, your mom, or your best friend for the holidays. But even the most inspired gift giver can sometimes come up short. Cookbooks have you covered. There’s a volume out there that’s just right for every food-loving friend and family member. Here are 20 new cookbooks worth seeking out this holiday season, along with just the right person to give them to. Deb Perelman’s Smitten Kitchen blog has won fans and followers with its spot-on recipe curation and Perelman’s winning prose — she makes you feel like you’re her friend. This book is a collection of recipes that, she writes, “don’t just fit into our lives, they make us happy.” Readers can reclaim joy in the kitchen, too, with cauliflower wedge salad, mini-matzo ball soup, tomato and gigante bean bake (a dish Perelman calls “pizza beans” to win over her son), street cart-style chicken and rice, giant oatmeal-raisin-chocolate chip cookies, and more. Jim Lahey is best known for his no-knead method of baking bread. He’s also behind New York’s fantastic Sullivan Street Bakery, where you can get a chickpea-fritter sandwich so good it will make you cry. That recipe is here, as are ones for apple-fennel pizza, brisket braised in black tea, and orange olive-oil cake. But more than anything, the book is a deeper dive into (mostly) no-knead bread-making, this time using sourdough starters. “Most everyone agrees there is some innate virtue in simplicity,” says cocktail writer Robert Simonson. Whether one is a purist, or simply interested in getting from Point A to Point C with expedience, “3-Ingredient Cocktails” has virtue aplenty. From the Old Fashioned to the Negroni to the Sidecar, some of the finest drinks fit into this category; the book has formulas for these and many others. Where are all the cookbooks from the second-largest continent? The publishing industry has some serious catching up to do when it comes to celebrating the cuisines of Africa. UK author Zoe Adjonyoh — whose father is Ghanaian and mother is Irish — is behind a successful pop-up called Zoe’s Ghana Kitchen. “I believe we are on the cusp of an African food revolution. . . . It’s the last continent of relatively unexplored food,” she writes. In this volume she offers the likes of pan-fried prawns in baobab butter; red red stew, black-eyed peas in spiced tomato sauce; pork ribs in sticky plantain sauce; jollof rice; and more. The dishes are laced with ginger, chiles, grains of paradise, and sorrel, but they work wonderfully in New England — there are, for instance, many things here to do with yams, for those who thought they’d already yammed them every possible way. Never has there been more truth in subtitling. This isn’t one of those pretty cookbooks that sits on a shelf. It’s a pretty cookbook filled with winning recipes begging to be made: cumin-roasted cauliflower and dates with tahini and pine nuts, littleneck clams with green garlic butter and leftover wine, vinegar-braised chicken with farro and watercress, impostor al pastor, perfect steak with buttered radish toast . . . Author Alison Roman understands not just what we want to eat, but how we want to cook it: “I promise that I will never ask you to make something in two skillets if it can be done in one,” she writes. If you’ve never longed to visit Turkey, you’ve never looked at Robyn Eckhardt’s blog, Eating Asia. Together with photographer husband David Hagerman, in this book she takes us on a tour of regional Turkish cuisine — from the tomato and white bean stew of Istanbul to herbed fish cakes from the Black Sea to spicy bulgur kofte from the Southeast to wheat berries with chicken and tomato butter from North-Central Anatolia. Bet you’ll want to visit Turkey now. “Feed the Resistance” brings together politics and the plate, with essays on activism and the roles food can play in it, alongside recipes from chefs, food writers, organizers, and more. You’ll find dishes such as tikka masala macaroni and cheese (from chef Preeti Mistry), mushroom gumbo (from Bryant Terry, chef in residence at the Museum of the African Diaspora), and Greek chickpea salad (from Turshen, who was behind last year’s hit cookbook “Small Victories”). Proceeds go to the ACLU. You’ll support Share Our Strength’s No Kid Hungry initiative with the purchase of “America the Great Cookbook,” which attempts to answer the question “What is American food?” The answer, as it turns out, is: gumbo from Leah Chase of Dooky Chase’s in New Orleans, sweet potato tacos from Guerrilla Tacos chef Wes Avila, pink deviled eggs from food writer Ruth Reichl, clam juk from Momofuku chef David Chang. Plus dishes from locals such as Ana Sortun, Joanne Chang, and Irene, Andy, and Margaret Li of Mei Mei. This year saw several notable cookbooks with local ties, such as “Homegrown: Cooking From My New England Roots,” by Townsman’s Matt Jennings; “Kristen Kish Cooking,” from the former Menton chef; and this one, bringing to your kitchen the recipes of the South End’s sassiest Asian restaurant. “Myers + Chang at Home” shows home cooks how to make our own dan dan noodles, tiger’s tears, soy-glazed salmon, and nasi goreng; it also offers useful tips on stir-fry technique, shaping dumplings, and more. Who needs to go out? Halibut poached in sherry-pimenton broth? Yes, that can be made in a slow cooker. Chef and “Top Chef” judge Hugh Acheson shows us how to use the 1970s’ favorite convenience device to turn out low-maintenance meals that will please today’s snobbiest food snobs. Think duck and andouille gumbo, osso buco with lavender-citrus gremolata, bo ssam — even jam. Celebrating women and food, Cherry Bombe magazine has a podcast, a conference, and now a cookbook. The pink volume emblazoned with a bright-red cherry offers a lot of bang for your buck: 100 recipes from 100 women in the food world, including chefs, cookbook authors, bloggers, and TV hosts. You’ll find offerings from the likes of Gail Simmons (charred pineapple margarita), Angela Dimayuga (red cabbage salad with sesame anchovy vinaigrette), Heidi Swanson (black sesame otsu with soba noodles and tofu), and Molly Yeh (funfetti cake with cherry filling). Cookbook author and former Chez Panisse chef David Tanis offers a thick tome of market-driven dishes (if one’s market happens to be in California). With its matte pages and clean aesthetic, it is as lovely to flip through as it is to cook from. Don a stylish caftan, crank up the Joni Mitchell, and make roast chicken with whole garlic heads, smoky Turkish eggplant, Hubbard squash with Parmesan and brown butter, and much more. For some, pizza is merely convenient takeout. For others, it is an obsession. These people do things like travel to Phoenix just to eat at Pizzeria Bianco, known as one of the best in the country. These people appreciate books like “Bianco,” which allow them to pursue their passion in the privacy of their own homes. In addition to pizza, the book also includes recipes for salads, sandwiches, and pasta dishes (spaghetti with crushed tomato, tagliatelle with lemon). There’s nothing distracting or overwrought; this food is based on purity of flavor and technique. Sure, Thai food is great with booze, but you don’t have to drink to appreciate its nuance. “Night + Market,” from LA chef Kris Yenbamroong, offers recipes for “grandma” dishes such as pad see ew and fish curry noodles, reimagined dishes (grilled catfish tamales, Isaan salmon ceviche), snacks and party dishes (roasted green chile dip, chicken wings, uni garlic fried rice), and more. He also argues we should be drinking more wine with Thai food. “Night + Market” has a forward by Andy Ricker, the chef behind the Pok Pok restaurants, who is also out with a similar-but-different book. His takes you inside the world of Thai “aahaan kap klaem,” or drinking food. You get tom som kai baan (sour Northern Thai “village chicken” soup), barbecue beef skewers, glass noodle salad, and, of course, phat khii mao (drunkard’s stir-fry), along with some feel-like-you’re-there street-stall photography. There are worse reasons to relocate to California than having easy access to Tartine Bakery. Barring that, there are cofounder Elisabeth Prueitt’s cookbooks. This latest features the kinds of things she cooks for her family in her own home — buckwheat crepes, kale and cucumber salad, salmon with chive-butter sauce, carnitas, birthday cake with fluffy milk chocolate frosting. When a book is dedicated “To midnight snacks,” you know it’s going to be good. In “BraveTart,” pastry chef Stella Parks offers serious recipes for fun treats, along with entertaining essays on their origins. Her clear directions will lead you to improved versions of classics — snickerdoodles, red (wine) velvet cake — as well as (tastier) takes on supermarket favorites. Now we can make our own Thin Mints, Twinkies, Pop-Tarts, and more. Yotam Ottolenghi’s savory cookbooks (“Plenty,” “Jerusalem”) belong on every shelf. Here he teams with pastry chef and longtime collaborator Helen Goh for a book that’s every bit as essential. It’s easier to mark the recipes one doesn’t want to make; the volume is filled with alluring desserts from tahini and halva brownies to apple and olive oil cake with maple frosting to frozen espresso parfait for a crowd.